The results of our product naming contest are in, so hold on to your seat as we announce the WINNERS. Before we do, since this IS the Buyers Guide, we would like to, once again, remind all of our readers of the fine retailers we have found in our years of publishing RYO Magazine. These are places where you, the adult smoking public, can find many or all of the products we review here at fair, competitive prices and be assured as well of friendly, reliable service. A list of these online sources immediately follows with links to their sites. Below that are the names of the winners of each category. 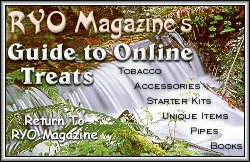 In addition some of the manufacturers who advertise in this publication sell to the public, so while exploring each issue, click on their banners as well to either buy or find out where their products may be available. have a refreshingly sweet, aromatic wintergreen or spearmint-like flavor. So there you have it. It is interesting to note that the last two category winners also submitted the top second place names (Mark Sheppard with Casablanca, and Debbie Karp with Emerald Ice) but to be fair and always generous we eliminated these excellent names as second place finishers and went to the third tier in these last two categories. And remember these are only the opinions of we a RYO Magazine and a few others who we let in on the debate during a New Year's Eve party where to get a drink our guests (the one's that could still read) were required to pick favorites from the list of about 50 finalists. That was a hoot! There were many great entries and we suspect that there were some real pros involved. All winners will be contacted by email and urged to call us at a special toll free number provided. In the event contact or age verification fails, we will post and contact substitute winners in their place. We hope you enjoyed the contest and let us know if these kinds of adventures are to your liking. There is no reason we cannot make it a regular (or at least semi-regular) feature in the future. And again thanks for the tremendous effort and response. Welcome to the RYO Magazine Buyer's Guide. This section is an ongoing, constantly updated resource. Supplies for RYO smokers need not be difficult to find. You have to be at least 18 years of age or in some cases 21 years of age to purchase them but given that criteria is met, this special section is dedicated to helping you find the best and most creative goodies out there. Shop around and patronize your local stores when possible and don't be afraid to try something new. Most people find their favorite tobaccos and sources only after much trial and error. We try to make it simple for you but remember the links and suggestion contained herein are only our opinions and the opinions of our readers. By the way, the category link buttons above are Java applets so if you can't see them, use the text links below. Enjoy!